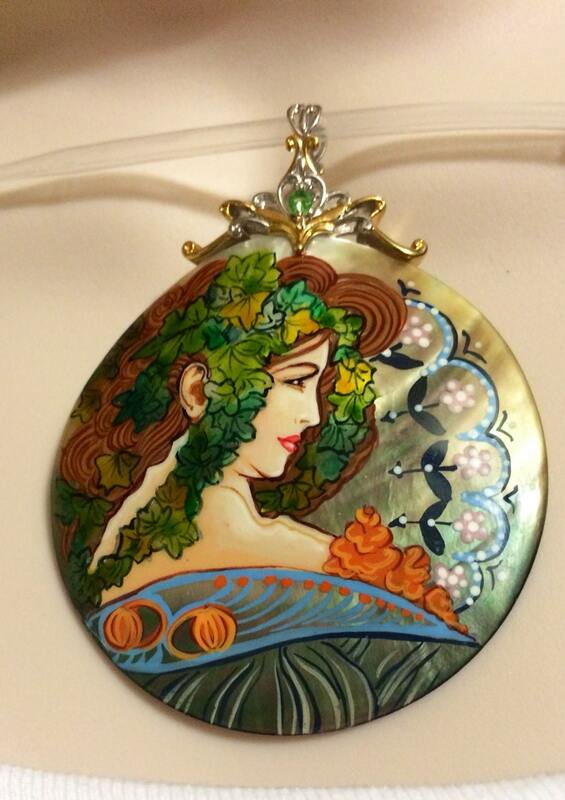 60mm Hand-Painted Mother-of-Pearl Ivy Lady & Tsavorite Two tone sterling silver and Palladium Pendant . A lady of style and elegance! Designed in sterling silver and palladium with 18K yellow gold plated accents, this pendant features one round shaped fancy cut 60mm multi color mother-of-pearl set in a fancy setting. 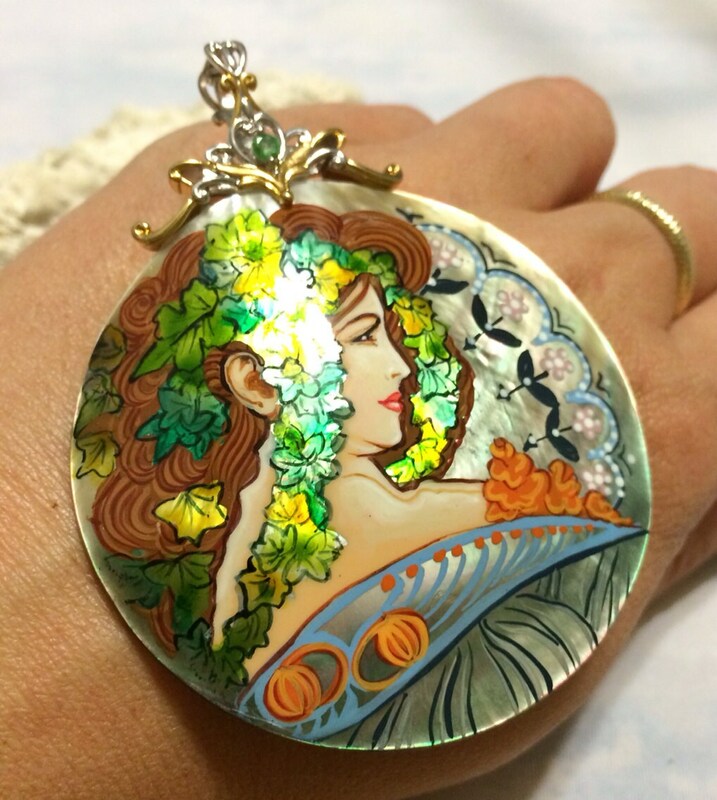 The pendant is adorned with gorgeous hand-painted image of the Ivy lady. One round cut 3mm tsavorite accents the pendant in a bead setting near the single bail. The total approximate tsavorite is 0.14ct. 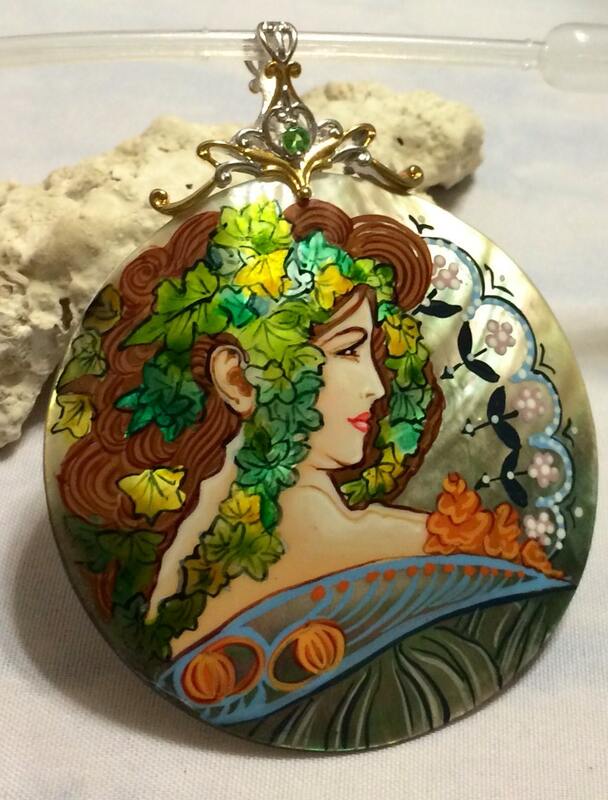 The pendant measures 2-15/16”L x 2-5/16"W.
Mother-of-pearl stone process in hand-painted. 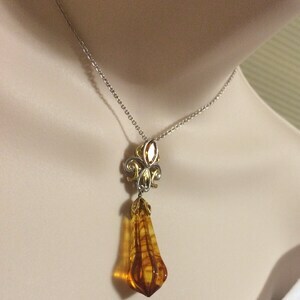 About the Design: Mother of Pearl shell has been hand-crafted with meticulous attention to detail to bring to life the rich features and vibrant colors of this wearable work of art. 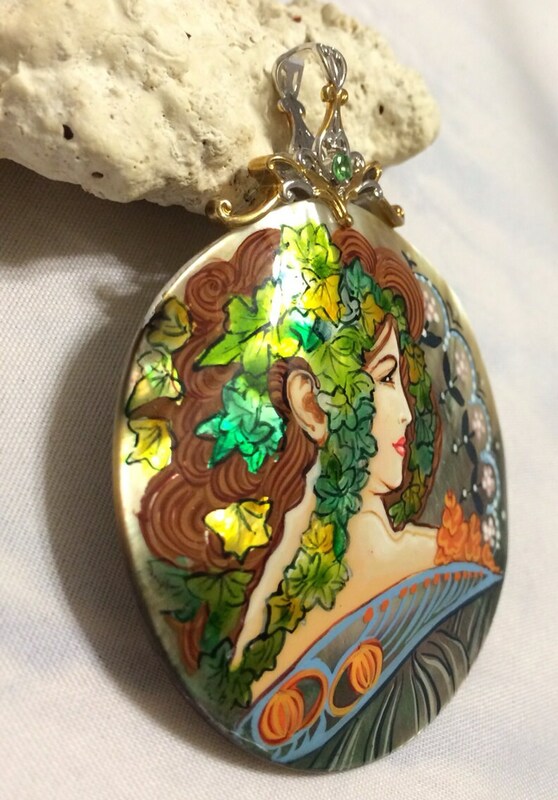 This pendant features the famed famed painting "Ivy lady". . 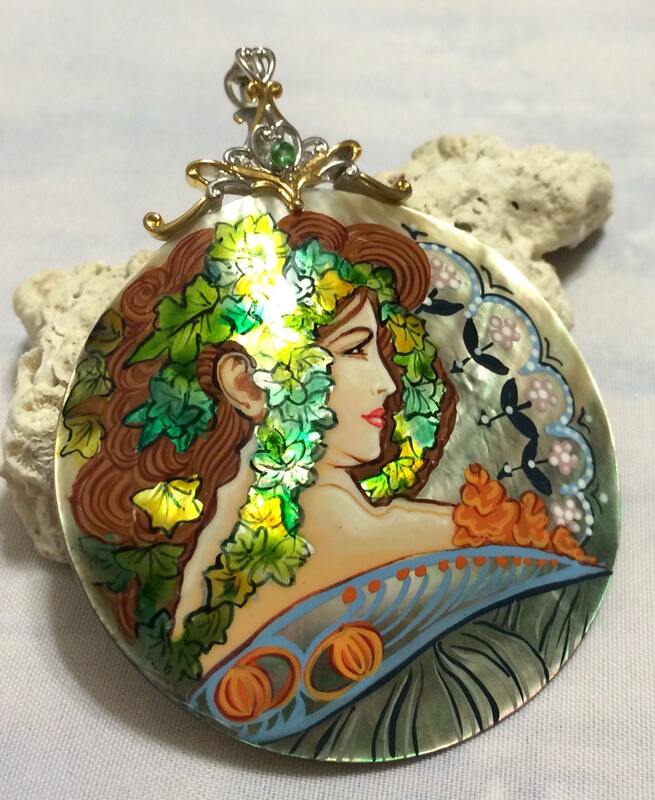 This shell jewelry piece has been painted using standard artist acrylic paints and then sealed with lacquer. Like pearls, this Mother of Pearl shell is organic and thus should be cleaned with a soft cloth and warm soapy water only as the need arises. Please carefully store your painted shell jewelry so that it does not come into contact with other sharp metal objects (such as various earrings or chains) to avoid the possibility of scratching the painting. Create a fashion buzz with this striking pendant!! Chain is not included. Just a pendant. 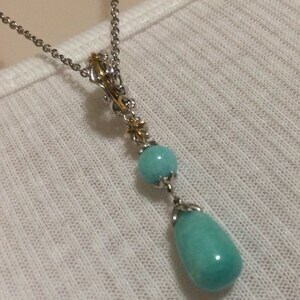 Amazonite Two tone sterling silver and Palladium necklace. 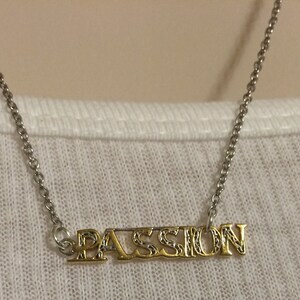 Two Tone Polished sterling silver and palladium with 18K yellow gold plated accents "PASSION " Necklace! 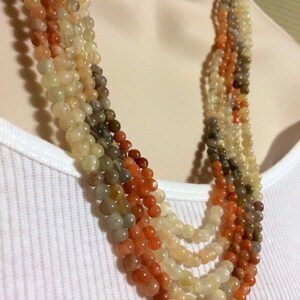 Huge Fluted Amber, Citrine and Orange Sapphire Two tone sterling silver and Palladium necklace.